The Sony SRS-XB501G is a party speaker that you can use both inside the house and pool-side. The speaker gets loud, sounds spacious, and lasts all day, which makes it great for using on the go. Once at home, you can plug it in, use it as a networked speaker and control it via Google Assistant. It does the former better than the latter, but overall it's a fine companion in either situation. 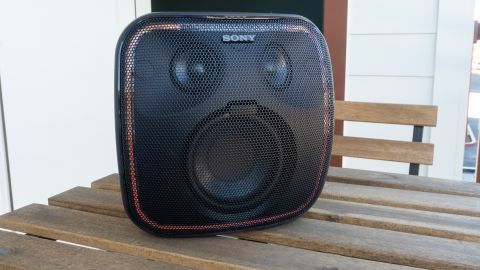 At 6 lbs (2.72kg), there’s no getting around the fact that the Sony SRS-XB501G is a big, heavy speaker. You'll feel it the moment you take it out of the box. But thankfully Sony saw the issue ahead of time and added a handy carrying handle to make lugging it around a bit easier. It’s nice to see that all major features can be controlled via the physical buttons without the need for a finicky app... however, the speaker does require you to download two apps if you want to use its smart functionality: both the Google Home app to set up the voice assistant in addition to Sony’s Music Center app. Google Home is self-explanatory but Sony's Music Center app allows you to tweak the light show and access to sound tweaks like Extra Bass, though unfortunately, the app is very bare-bones and difficult to navigate. If you're planning on using this wirelessly, the Sony SRS-XB501G supports Bluetooth 4.2 and Google Cast. Importantly, you’ll find all of the speaker’s controls up top. We’ve tested other speakers in Sony's Extra Bass lineup like the Sony SRS-XB40 in the past and weren’t impressed by their bloated bass response. Thankfully, the SRS-XB501G offers nice balance and can play loudly without distortion. As a Google Assistant speaker, the XB501G is simply average. With music play loudly, you’ll have to shout at the speaker for it to hear you. If you're looking for a point of comparison, we put the voice detection on par with the JBL Link 300. Average voice detection aside, the speaker works just like every other Google Home speaker. The Sony SRS-XB501G is an interesting product - and one that bridges the gap between a party and home speaker. On the go, it’s a good speaker that offers spacious, balanced sound, good battery life, and IP65 water resistance. However, its average voice detection and dated styling make it seem out of place inside the home.